Well, it’s been an interesting couple of months. I wanted to upgrade TNG (the Web site application used to present my genealogy database and information) to Version 9 to take advantage of some new capabilities. 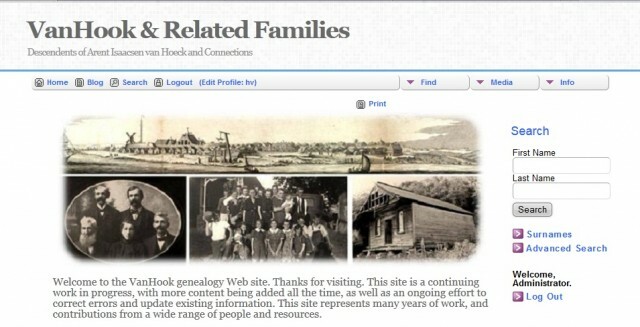 Simultaneously, I also wanted to couple that with a genealogy blog site (which you are reading now). I also wanted to refresh the “look and feel” of the web site (and make it somewhat consistent with the blog site). I thought the old site layout and colors were somewhat dated. Anyway – after catching minutes here and there to work on this – it is somewhat up and running. I still need to reload all the media content (photos, documents, histories, etc.). That will take a bit of time because I wanted to also clean those up a bit and get a little more standardization around the labeling and presentation of them. There may be random errors and functioning issues on the new site. So, please be patient. Thanks.